Post top writing surface securely attaches to (2) barrier posts over top of barrier without tools! Place writing table so customers in queue can fill out forms to expedite service! 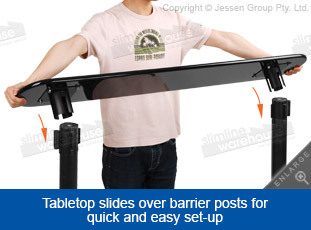 Perfect for use with our line of stanchions available here! 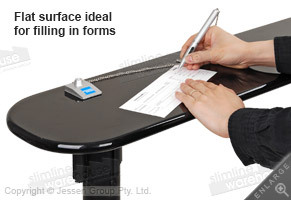 The post top writing surface helps visitors to write on their deposit slips or fill out important forms while they are waiting in the queue. 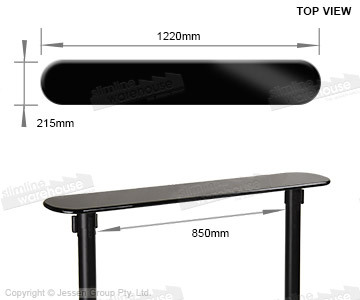 This table attaches to the tops of (2) of crowd control retractable belts quickly and securely with no tools needed. Using this type of writing table takes less room up on the floor whilst still helping guide visitors to the front area in an organised manner. 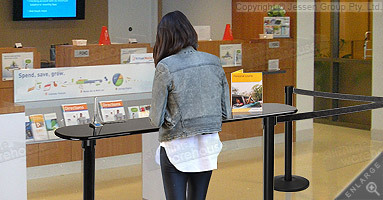 The post top writing surface, like other stanchion accessories , is made from solid timber for a strong display. This durable table looks great as well, with the sleek black surface offering a professional look that works great in many locations, including banks, exhibition halls, transit stations, airports, trade shows, and even hotels. Many locations also put acrylic brochure holders or other marketing materials on the tabletop to provide additional information to visitors. The banner display systems, display banners are retractable displays that make positioning the units or storing them in between uses simple. A carrying bag is also included that makes transport of the lightweight portable trade show stands easy, with the shoulder strap helping to offset the burden. The banner is also kept free of grime or dust gathering when stored within this bag. Assembly of this custom advertising stand is easy as well, with no tools required for set-up in a few minutes. The telescoping pole easily attaches to the base and top of your custom designed graphic in order to allow you to focus on other tasks! This display is designed for placement in shopping centres, retail stores, exhibition halls and trade shows! There are hundreds of products available now for you to purchase in our online catalogue, with the wide variety of options encompassing many categories to ensure you can find the right product for use at your location. Wit hover 20 years in the business, Slimline Warehouse has become a national leader due to our low prices on high-quality items. Despatch is provided same day from our warehouse with most in stock items that are purchased by 1pm EST. Order for your home or business today in Adelaide, Brisbane, Perth, Melbourne, Sydney, Bendigo, Newcastle, Darwin, Hobart, & anywhere else in Australia!